We don’t have a lot of fussy date nights. In fact, our usual haunts are (1) pizza; or (2) Thai food. Given how obsessed my husband is with pad thai (I don’t think he’s ever ordered anything else at a Thai restaurant), this vegan pad thai was a long time coming. 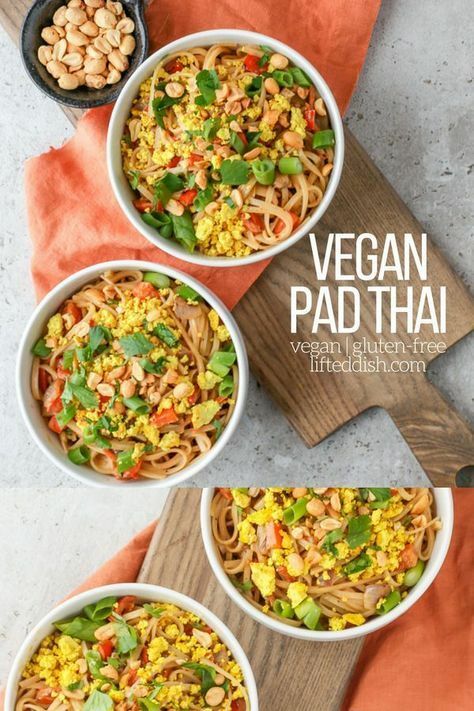 Thai restaurants are usually pretty vegan friendly, but pad thai is often made with eggs. Many other Thai dishes (especially curries) use fish sauce, so I always ensure that I ask for my dish to be prepared without fish sauce. Some places are more accommodating than others, but we have a few solid places near us in Orlando. Regardless, I wanted to create my own easy, homemade vegan pad thai so that we could enjoy this dish more frequently. And I’m so happy with how it turned out! 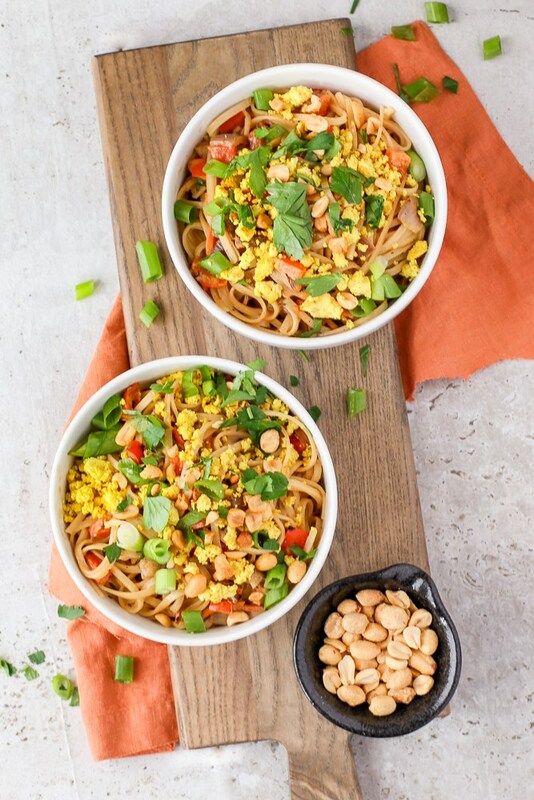 This vegan pad thai comes together in 30 minutes and is totally comforting and delicious. I hope this recipe inspires you to skip takeout and have some fun in your kitchen! If you make this recipe, be sure to tag me on Instagram @lifted_dish and use #lifteddish – I’d love to see your creations! Prepare the sauce by whisking together all ingredients until thoroughly combined. Set aside. Heat a skillet over medium heat. Prep the tofu egg crumbles by crumbling the block of tofu into a large mixing bowl. Add the tumeric, garlic powder and mix to combine. Season to taste with salt. Spray the skillet with nonstick spray and add the tofu to the pan. Cook, stirring frequently, until lightly browned, about 6-9 minutes. Set aside. Prepare your rice noodles according to the package directions. If you are using rice noodles and not linguine, note that the instructions will often require you to soak the noodles in hot water (rather than boiling them on the stove). While noodles are soaking or cooking, place the carrots, bell pepper, and onion in the skillet you used to cook the tofu. Cook the veggies over medium heat until cooked through, about 8-10 minutes. Add some water if they start to stick to the pan. When the noodles are ready and the veggies are cooked, in a large bowl combine the noodles, veggies, and sauce. Divide into individual bowls and top with the tofu crumbles, chopped scallions and peanuts. Serve immediately.